The best combo grills are the ones that offer tons of space, and offer quality gas and charcoal cooking, without one side being stronger than the other. They’re supposed to be your complete kitchen unit, and they’re becoming more popular because the days when charcoal grilling was seen as the only authentic outdoor cooking method, are gone. Buyer’s these days are much more open to the prospect of owning a gas grill, and many believe certain foods taste better using gas rather than charcoal. 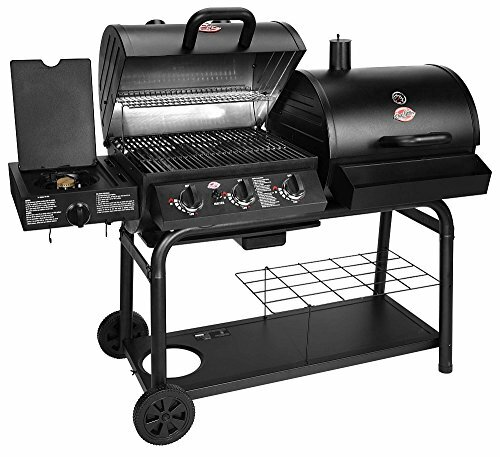 I thought I’d try to help potential buyers out, by taking you through the pros and cons of the Char-Griller 5050 Duo Gas and Charcoal Grill, and discussing what it does for you, in more detail than you’d find in an online description. Ultimately, the choice will be yours, to purchase, or to choose something else, but I hope to inform that choice with knowledge. 12,000 BTU Side-Burner can be a little weak. Despite the heavy steel construction, they’ve managed to keep the weight down to 168 pounds, which has to be regarded as a huge success in portability. The 5050 Duo also looks pretty good too, and these large combo grills are usually giant chunks of metal, with no great design qualities, so this is definitely a bonus. The measurements are 48 inches in length, by 21.5 inches of width, and it comes at a height of 13.5 inches, but the wheels are of good quality, so it’s easy to roll into place. These grills are never super-portables you can slot into the car and take out with you, so great big wheels and weight are what counts, so we must give Char-Griller credit for keeping the weight down by providing good wheels. 40,800 BTU’s across 3 burners means this is a huge muscle gas grill as it stands, but the BTU’s could even have been higher. You get 438 square inches of space on the gas side, so it might have needed more to completely heat in quick time if it didn’t have superb cast-iron grates. The grates mean the BTU’s don’t matter, because, with their excellent thickness, and great quality design, they will disperse the heat they’re given very efficiently, so you’ll get some excellent taste on the gas grill side. There is however a small problem with the side burner, that the grates can’t fix; it’s weak, and should only be used for cooking sauces. The charcoal side is a much simpler affair, where power doesn’t come into play, so the grates don’t need to save anything; they just cook terrific food. The size here is huge, and for those with large families, this might be the reason they buy the 5050 Char-Griller. There’s a total of 1260 square inches of cooking space, split between two main grills, with the gas grill and the charcoal grill both measuring 438 square inches respectively. This means there’s also 384 square inches of secondary cooking space, making this one massive grill. When you consider that most of this space is covered by cast-iron grates, the quality becomes very real. One issue, however, is the temperature control, because with the vents and dampers not being all that good, and few in number, the heat control is provided by the adjustable grates. It’s great in theory, but in practice, this method never allows buyers the same opportunity to experiment with different styles of grilling, as they would with vents and dampers. A great success here is in the storage capacity, with an additional shelf below the grill for pots and pans, and buyers can fold down the cover of the side-burner to create even more room. This is another design quality the Char-Griller 5050 offers, and I found the overall design to be very impressive, being both aesthetically pleasing, and functional at the same time. Speaking of functional design qualities, the ash dump pan can be removed very easily and is contained within the unit, so when you’re charcoal grilling, you won’t be batting away ash floating in the wind. This also makes the cleaning process easier, as does the porcelain-enamel coating on the grates. For anyone thinking of using the 5050 as a smoker, it’s not possible on this grill, unless you purchase the firebox separately, and you can then turn your charcoal grill into a smoker. The side-Burner is a little weak, and the BTU’s are a little low on the gas grill, but neither of these flaws really matter, because the cast-iron grates help you create some restaurant standard quality food. The design is very attractive, the 5050 has lots of space, it’s lightweight, despite being durable, and it comes at a very decent price. The Verdict: This is one amazing combo grill.